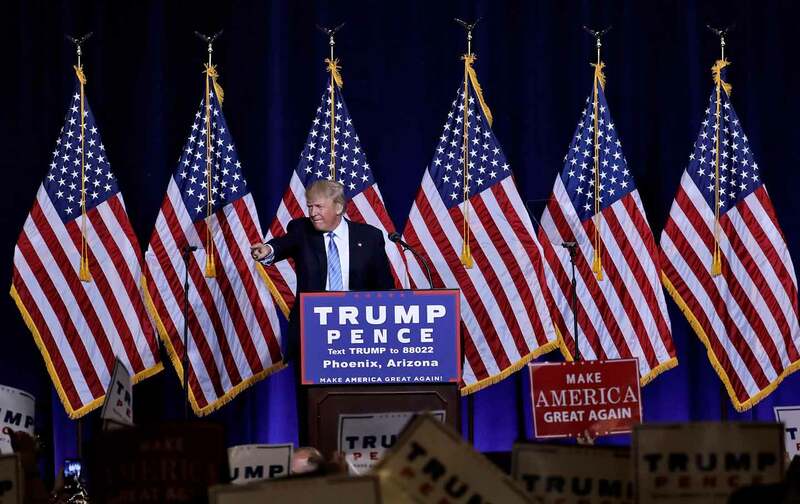 In Mexico, Trump is solemn and praising; in Arizona, he’s back to hysterical horror shows. One never knows what Donald Trump will say—the candidate has flaunted his unpredictability for over a year. But now, finally, in the general election and with his stance on his core political identity in question, he has delivered the most anticipated speech of his political career. And here’s the answer. There will be no flip-flopping. There will be no “softening.” There will be no pivot. If anyone had any doubts, Trump put them to rest on Wednesday evening. The deportation force? He’s standing by it. The defunding of sanctuary cities? That too. And there’s more. Trump reiterated that undocumented immigrants who’ve been convicted of crimes will be swiftly deported. “Day one, my first hour in office, those people are gone,” Trump said. He also pledged to revive programs that require partnership between local law enforcement agencies and immigration authorities—programs that the Obama administration has retired or lessened. One that Trump is fond of, called 287g, deputizes local law-enforcement personnel to act as immigration agents. The priority will be to expedite all removals of all undocumented immigrants. To that end, Trump also promised that any undocumented immigrant who’s ever arrested will be sent into deportation proceedings. In Trump’s imagining they never need be charged, or even convicted of any crime for them to be separately detained by immigration officials. He also said that he will go after the most politically sympathetic group of undocumented immigrants: so-called DREAMers who came to the United State as children, and who have to clear a host of hurdles to qualify for the executive action program President Obama announced in 2012. Deferred Action for Childhood Arrivals, has granted undocumented immigrants who came into the country as children short-term reprieves from the threat of deportation. (A second executive action remains tangled up in court.) Trump, reiterating earlier pledges, said he would throw both executive action programs out the window. The bottom line? Donald Trump put every single undocumented immigrant on notice. And the dividends would be immediate, Trump promised. “Gangs will disappear, and the gangs are all over the place,” he said. “We will have a peace dividend,” which, Trump said, would allow the United States to rebuild “American inner cities.” Trump returned to a now-familiar refrain, arguing that African Americans and Latinos are hurt by the presence of undocumented immigrants. With undocumented immigrants banished from the country, peace and prosperity would reign. This was no general election appeal to reach past the converted. Even though he promised a departure from the “usual” campaign speech at the top of his remarks, Wednesday night was primary-season Donald Trump in his most comfortable mode. He weaved demagoguery and nationalism together into a hysterical horror show, ratcheting up the volume as he moved through the speech until he was shouting every single line. At the top of his speech, he ticked off the names and detailed the deaths of people who’d been reportedly killed by undocumented immigrants, and at the end of it stood next to his podium as mothers and sisters and cousins of those people spoke their loved one’s names and pledged their allegiance to Trump. Perhaps most amazing is that this is a speech that was scheduled, canceled, scheduled, then canceled again. It finally took place Wednesday hours after the Trump campaign pulled off what at first looked like an incredible feat with his quick trip to Mexico. Trump, a man who’s never held public office, whose career has been plagued by scandals, bankruptcies, and lawsuits, who’s publicly and repeatedly insulted women, Muslims, Mexicans, while running for the highest public office in the United States, stood side by side with a head of state, Mexican President Enrique Peña Nieto, on a formal stage. In his remarks from the stage in Mexico, Trump went to great lengths to praise Americans of Mexican descent, calling them “beyond reproach,” and “spectacular, hard-working people.” Trump didn’t depart from his script, and spoke in nearly somnolent tones. Such decorum and composure from Trump is novel—and the optics were striking. Back in the United States, by the time he hit his stride during his remarks, he had shed the statesman’s straitjacket. His return to his old self was swift. His remarks in Phoenix had echoes of his speech at the RNC earlier this summer. Both speeches were long, for one—each clocked in at over an hour. And Trump’s Wednesday night speech was fiery, leaning on his usual depictions of immigrants as murderous, villainous, sexually deviant leeches. And then, he not only pledged every harsh anti-immigration tactic he’d floated for the past year, he expanded on them all. For all the anticipation, there was nothing new to see in the end.